(CNN) - Ron Paul has no plans to launch a third-party bid for the White House in 2012 if he fails to win the Republican nomination, he said Sunday. "I have no intention of doing it," Paul said on CNN's "State of the Union." "Nobody's particularly asked me to do it and they know what I'm doing and I have no plans whatsoever to do it." Paul ran as a Libertarian Party candidate in the 1988 presidential election and as a Republican Party candidate in the 2008 election. Although he did not explicitly denounce the idea of a third-party bid in this election cycle, Paul insisted that such a candidacy would not "doom" Republican chances by diluting the conservative vote. "It would cause a little bit of a problem," Paul acknowledged. All I can say is I hope he loses. He is evil and will do great damage to the great American government. Why did you feel the need to write 'YET'? He said he has absolutely no plans to do it. Why should he issue any opinion at all about what future events might or might not do? Why don't you ask Romney if he'll run 3d party? Has he absolutely ruled it out? His ideology is like communist ideology...it is not workable in Democracy. It is going to be another India. OK, Shame on 33% said that Mormon is considered to presidential while 67 percent does not matter. Educate these idiotic Americans, Obama. God bless you. These idiots want GOP and their free war money, while drafted to have sent out on wars. They get peanuts, these idiots do not know, nor care for the nation. Pity. Obama2012. Listen, health care is perfect and long overdue for this nation, 50 or more employees of the companies should provide health care coverage. OK, true, true, true...Obama2012. 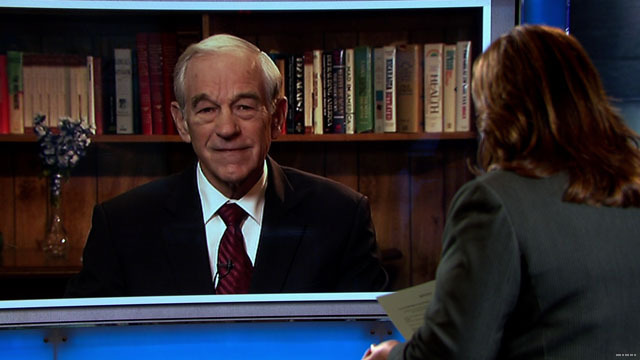 Who is Ron Paul's wardroab assistant? His suits are way too big, trying to make a small aged man look like more vibrant and youthful? Never happen, he's over the hill as well as his ideas are way out there. Note to GOP: keep looking for better choices. If Ron Paul does not get the Republican nomination, America's best interest would be served if he politely stepped out of the race. Think about it. His consituency is strongly conservative. They are not Democrats and a very small minority of independents. Most independents are moderates. If Paul cannot carry enough Republicans to win the nomination, certainly he will not make up for it in the General election with the minority of independents who would vote for him. In fact, not all Republicans who vote for him in the primaries will vote for him in the General Election because they will want to vote for the Republican nominee to make sure Obama is defeated. Ron Paul's best bet to get the Republican nomination is to come out clearly here and now promising that he will not run if he is not given the Republican nomination. If indeed the GOP is worried that Dr. Paul would run as a third party and hand the election to Obama then it would make sense that they would want Dr. Paul as THEIR candidate and then beat Obama. Sadly, they just cannot stop their war loving ways and they would rather have four more years of Obama with continuing war then win the presidency and get this country back on track. He's waiting for the statisticians to tell him who it would help more, dems or reps. He'll set us back almost as far as BHO has. We need a real conservative candidate, not a class clown. We need to avoid not only the social conservative attack on women's rights, but we really need to avoid the alleged fiscal conservatives who added $5.5 trillion to our national debt with unfunded wars, unfunded tax cuts, unfunded bank bailouts, and unfunded drug programs. I could never vote for or trust a man who raised a child who believes that businesses and companys should have the right to discriminate against others. If this nut gets elected Dred Scott will live again. Thank God for President Obama stopping the job loss of 8 million in Bush's last three years. The shrub's presidency had one million jobs created in 8 years, (Carter had 12 million new jobs and Clinton 22 million ) and Obama has seen growth of 2.5 million private sector jobs. I won't even mention the destruction of our retirements when the Texas Tornado was responsible for the stock market drop from 14,000 to under 8000 when a real president, Obama, took over. Still over 12,000 as of Friday. Ron Paul consistently offers interesting contrast with his proposing a non-evasive, permissive style of government but when checking history “deregulation”, “open markets” and lax enforcement have always produced endless cycles of costly crisis, where the few with opportunity constantly take advantage. Human nature actually dictates that given the opportunity, run-away greed, gross dishonesty and self-indulgence will simply take over. The only way “small government” could ever really work is when kept big enough to include good regulations, diligent oversight and necessary enforcements to prevent the problems we have seen repeated with savings-and-loans, banks, dot.coms, investment, financial and mortgage industries as well as seen with corporate corruption, Enron style – to really have a “level playing field”, government has to literally keep working it smooth. The trouble is that when you let things seek their own natural level, there are those who will always take advantage as “power corrupts and total power totally corrupts”. This country is constantly being pushed towards becoming a two-class society with the few, the “power”, competing to have everything and the majority struggling to survive. Ron Paul likely would just be giving the few “Carte Blanche”. Run, Ron, Run!!!!! We need you as a third-party candidate!!! What I want to know is, will Romney play spoiler this election and give us Obama for another four years? And will Herman Cain run as a third-party candidate when his campaign fails and he's not flavor of the month anymore? Ron Paul is the most intelligent man in the race. If you want your country to get out of this unsustainable path than Ron Paul must be elected. Every other candidate will lead to more of the same. We need radical change and cuts in government spending. He will win Iowa, and will continue on to receive the nomination. Obama has no chance in 2012. Even if he doesn't run as a third party, his base is so loyal and will most likely write him in anyways. The commentary on this article is embarrassing. I am amazed at the level of ignorance. Not only is Ron Paul right on the issues, but he is probably the most informed politician this country has seen since Thomas Jefferson. I can tell you that if you disagree with Ron Paul it is because of your lack of understanding. Every issue I disagreed with Ron Paul on, once I studied, I learned that I was wrong. Try studying history before you put down Ron Paul. I expect that this nation will never recover if Ron Paul isn't elected. We are at a crucial time in our nation's history and I fear that we may well be too late to save the country. Pass on Ron Paul and you pass on your last hope for freedom and prosperity. As I sit here and read all of these negative comments about Dr. Paul, another political quote of Herman Cain comes to mind. STUPID PEOPLE ARE RUINING THIS COUNTRY!!!! I do not agree with all of Ron Paul's decisions but I can promise you this man is not the class clown as one poster claims! Nor would he ruin this government. The only government plans he would ruin is the plans of stupid politicians to run this country in the ground and bankrupt this nation! We borrow 40 cents on every dollar we spend. I will ask everyone reading this, who has a plan to stop this madness? If this does not stop soon what will happen to this nation? What happens to companies and individuals that spend 40 cents more than they take in? BANKRUPTCY! I will ask this once more, Of all the presidential candidates who has offered a plan to reduce spending to sustainable levels, besides Ron Paul? Ron Paul consistently offers interesting contrast with his proposing a non-evasive, permissive style of government but when checking history “deregulation”, “open markets” and lax enforcement have always produced endless cycles of costly crisis, where the few with opportunity constantly take advantage. Human nature actually dictates that given the opportunity, run-away greed, gross dishonesty and self-indulgence will simply take over. The only way “small government” could ever really work is when kept big enough to include good regulations, diligent oversight and necessary enforcements to prevent the problems we have seen repeated with savings-and-loans, banks, dot.coms, investment, financial and mortgage industries as well as seen with corporate corruption, Enron style – to really have a “level playing field”, government has to literally keep working it smooth. The trouble is that when you let things seek their own natural level, there are those who will always take advantage, as they say “power corrupts and total power totally corrupts”. This country is constantly already being pushed towards becoming a two-class society with the few, the “power”, competing to have everything and the majority struggling to survive. Ron Paul likely would just be giving the few “Carte Blanche”. There simply are no easy answers. Why does the media constantly ask Paul these questions concerning third-party candidacy? Because they want to further discredit his chances at the Republican nominiation. mb2010a: "The straw polls he just won are a joke." This is what the media wants you to think. However, look at how they jump for joy when another candidate wins one. Four and the Door: "His consituency is strongly conservative. They are not Democrats and a very small minority of independents." I strongly disagree. I am one former Democrat that recently swiched to Republican just to vote for Paul and I have heard many others do the same. If you really want Obama out, Paul is the best candidate to run against him. Paul will get the Independent and moderate vote. Nobody else will come close to his support in these areas. diridi: "His ideology is like communist ideology." That is quite an ignorant statement. His platform is small government. He is against the Fed, the DOE, the Welfare State, government regulation, Federal Income Taxes, Social Security, etc. If this sounds socialist to you, you don't know the meaning of the word. RJWTimes: "He is evil and will do great damage to the great American government." Care to back that up with facts? Give instances where his platform is 'evil'. Otherwise, please stay in England. kat: "He'll set us back almost as far as BHO has. We need a real conservative candidate." Again, I disagree. He will undo not only the damage this administration has done but the previous administrations have done. Our current state is not all Obama's fault, but the fault of all administrations in the last 30 years. In addition, Paul is the only real conservative candidate. All others are bought and paid for.